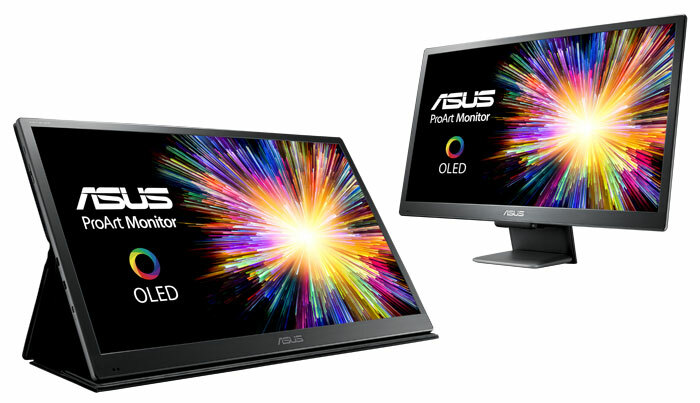 Asus has launched a new monitor into its ProArt range. 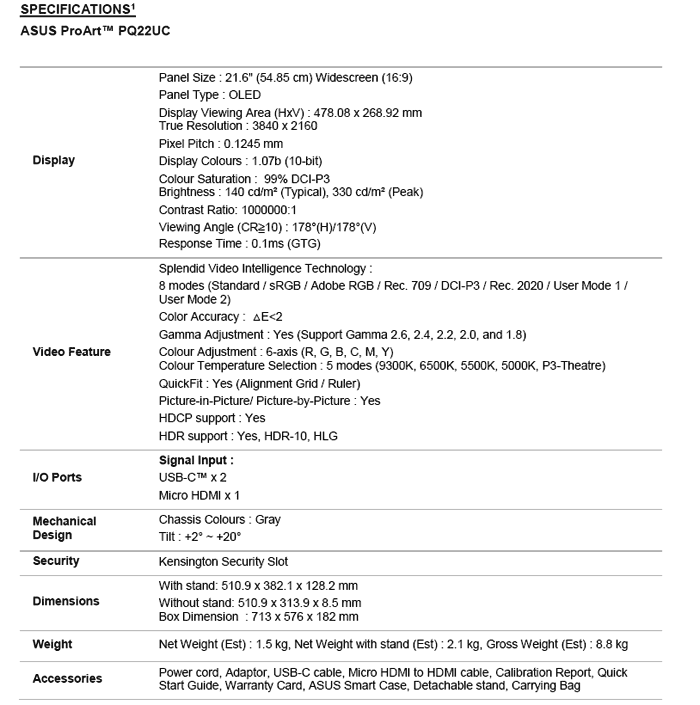 In essence the new Asus ProArt PQ22UC 4K HDR professional monitor is a 21.6-inch 4K monitor, delivering a high ppi (204ppi) for a desktop monitor. Some might appreciate the ultra-sharp visuals this affords, and there are other attractions too, as you will find out below. 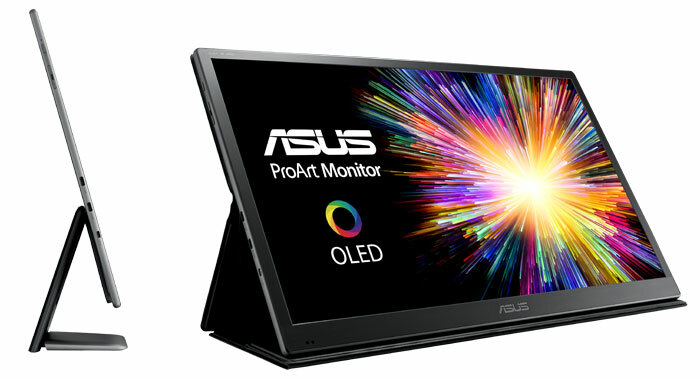 The ProArt PQ22UC is designed around an advanced OLED panel "with pure RGB self-illuminating pixels and 1000000:1 contrast ratio for enhanced HDR with deep blacks and tonally accurate highlights," says Asus. It leverages Asus Smart HDR Technology for support of multiple HDR formats, including HDR-10 and HLG. Another important property for a 'Pro' monitor is colour accuracy and the ProArt PQ22UC is factory calibrated with ΔE < 2 colour accuracy and Asus ProArt Calibration Technology. Furthermore, the 10-bit panel with 14-bit internal lookup table can reproduce 99 per cent of the DCI-P3 gamut, and delivers the deep blacks you become accustomed to from OLED panels. Colour is claimed to be highly uniform across the screen with 95 per cent uniformity compensation guarding against fluctuations in brightness and chroma. Another stellar spec of this display panel is its touted response time of 0.1ms. Asus says this specification means that the ProArt PQ22UC is "the fastest monitor in the market and delivers outstanding, blur-free performance when displaying videos and other animated content with fast action". Asus is marketing the ProArt PQ22UC with its compact size as a key selling point. It asserts that this monitor is a good solution for creatives to lug around to clients to showcase their work, on location. The monitor is ultra-slim (8.5mm with stand detached) and light (1.5kg, or 2.1kg with stand) to appeal to those after a portable monitor. Interestingly the stand can fold flat or the supplied carry case can be folded to prop-up the monitor in portrait or landscape mode. Asus doesn't mention the size/weight of the power brick but the monitor can alterntively be powered via USB, which also supports the video input signals. Connectivity on offer includes USB-C x 2, and Micro HDMI x1. There doesn't appear to be any speakers in the monitor bezels, sides or back. Asus first showed off the ProArt PQ22UC 4K HDR professional monitor at CES 2019. In its email to HEXUS today it didn't supply a specific release date or provide pricing indications. The official product pages are redirecting to the Asus home page at the time of writing, hopefully this will be fixed soon. Official UK price is £4,799, available this spring.